Anyone who watched BBC4's Tube Night and the Arena programme will probably remember the section about the Tube's lost property office and the weird items that people have left behind on the London Underground. The manager Ted Batchelor had been on a mission to find the person who left behind the contents of an urn complete with ashes, that was found on the Tube nine years ago. Amazingly the family have been found, thanks to John Fisher, an amateur genealogist who took it upon himself to find the family. Quite how he did this I don't know, but the family had the urn amongst some luggage which was stolen from a British Rail train. Thieves had taken the bag with the urn onto the Tube and discarded it when they realised it was of no value to them. Now Molly Maile has finally been reuinited with her father's ashes. Thanks to the show's director, Zimena, for calling me at lunchtime with this happy story. Only one victim this week who might also be a candidate for the "what not to crochet blog" - there's a brilliant crochet devillish gimp looking mask on the latest entry. One of those occasions when you want to say "Erm, I think you've got something stuck on your skirt". Maybe her skirt got mixed up with some super glue when it was in wash. She managed to rip most of the other items off - hence the frayed hem, but the pink doiley wouldn't budge - at least not without taking away the remainder of the skirt. Loving the butterfly laundry bag though, an interesting take on the stripy hessian looking ones or the shapeless IKEA jobbies. 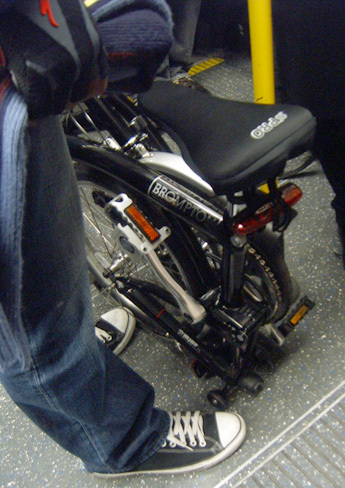 First time I've ever seen a Brompton fold up bike on the Tube and was really pleased to see how small it becomes. 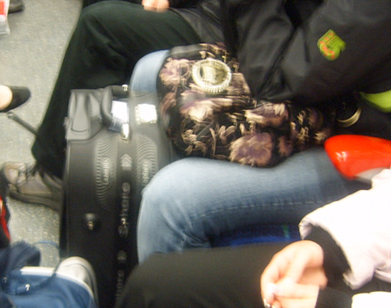 Loads smaller than most people's luggage that I have to contend with on Heathrow trains on the Piccadilly Line. Not sure how easily they unfold though as he didn't get off at my stop. Looks very snazzy though and I pictured him, just shaking it and it bouncing into shape, ready for action. Fold up bikes are the only bikes allowed on the whole London Underground network. With other bikes you can only travel with them on certain lines (although never on the DLR and Waterloo & City Line & Victoria Line) and at certain times (normally outside peak hours). I found this puzzling though - "Bicycles may also be taken during rush hour in the opposite direction to the majority of travellers" In the rush hour, it's hard to work out what the opposite direction of the majority of travellers is. If only TfL had got together with Ken to give a special welcome to the billionth person travelling on the London Underground this year. You can picture the scene. You're going through the barriers at Leicester Square, you're in a bit of a rush to get to work, you slam down your Oystercard and instead of the red "Seek Assistance" flash that you always ignore, the forecourt erupts with dancing girls wearing flourescent waistcoats and little else. A Big Brother tannoyed announcement booms "You are our billionth customer". Cliff Richard sashays over with his trademark sideways dance, singing "Congratulations". Followed by Sheriff Ken with a prize newt, who warmly shakes you by the hand and offers you free travel for the rest of your life. Transport Commissioner Peter Hendy, stops MySpacing and hands you a glass of champagne. Bob Crowe promises never to organise a strike on your line on days that haven't got a y in them (looks like another strike is brewing for Easter Monday). In reality, I imagine that the billionth commuter (and it could have been you), probably experienced a delay on the Northern Line and had his or her face shoved in the armpit of a fellow commuter. Well done (I think) to getting a billion passengers this year - the first time in the 144 year history of the London Underground. In other news TfL are looking for the person who ski-ed down Europe's longest escalator at Angel to give them a good telling off. What if it's too busy for Sardine Man to get on? 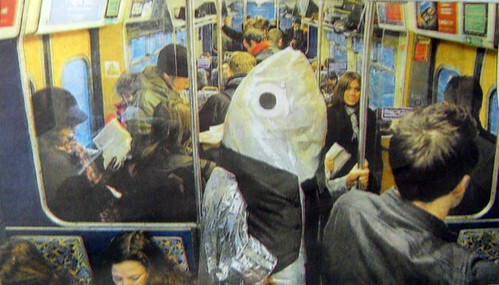 Yesterday Transport 2000 re-started their "Sardine Man" campaign to highlight some of the most overcrowded train journeys in England & Wales. They aim to encourage the Government to increase capacity and relieve congestion on the railways. I'd to see him pressed up against commuters on the Tube. "It's Monday morning. It's 8:30am and like millions of Britons I've not long wiped the scales from my eyes, so I can be forgiven for being a bit bleary. But casting another fish-eyed look over the carriage confirms what I first suspected – there are empty seats on this train! Wait a second... this train's EMPTY! Does that mean my one-fish odyssey across Britain’s most crowded rail routes is over before it's begun?" As I survey the carriages glinting in the spring sunshine all I can think about is those poor, unfortunate commuters I saw this morning. I'm sure they’d have appreciated a few extra carriages on their train. I head for a hostelry nearby and order up a pint of Coddingtons with a Skipjack Daniels to chase. Yes, yes it's only mid-morning but us fish have to keep well-oiled – and I need to sit down and figure this out! I am Sardine Man – hear me bore!." He then goes on to explain "no growth franchises" which train operators received in the nineties in the rest of his blog post. Watch out for his next post and if you're on any the overcrowded routes see if you get a picture. Yesterday, the only Tube station that has nothing in common with a mackerel had a deadly gas attack simulation to see how quickly toxic substances would spread in a real terrorist situation. Scientists released harmless sulphur hexafluoiride (a gas used in tennis balls) into parts of the station and then meausured air flow and penetration levels. The station was open as normal during the exercise and apparently will be repeated this coming Sunday. A Department for Transport official said: "We want to be able to find out how quickly the substance moves around and where it goes to. "St John's Wood was chosen as a typical Tube station with just one way in and out and with one up and one down escalator." Were you around the station at all on Sunday and did you notice anything? I wonder if the experiment will be repeated on the trains themselves though. I caught a really sulphuric whiff of something on my Piccadilly Line carriage this morning. But in true Tube form, no one else showed any signs of noticing the rotten egg smell - which fortunately disappeared after a minute or so. The first significant arrests have just been made in connection with the July 7th bombings where 52 people were killed on the London Underground and a London bus. The suspects were taken to a central London police station to be questioned. Searches were underway at five houses in the Leeds area and two premises in east London, the police said. No one has yet been charged in connection with the July 7th attacks, in which all four bombers died. Tired of your blue wallet? 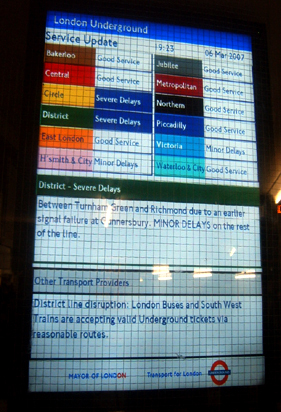 Badoyster was recently launched by Ben & Tim who said "After decades of putting up with the diabolical underground service and the heavy handed tactics employed in the switch-over to the new Oyster system enough was enough. We'd succumb to the pressure and buy Oyster cards... but only if we got to re-brand them to show what we thought of the 'service' we were being forced to pay an extortionate amount of money for." Currently you can choose from Sardines, or a Roulette design - "Every day on the tube is like a game of roulette. What excuse will it be today? The excitement never ends!". But hopefully they'll create more designs in the future. Thanks to Cath for initally giving me the heads up on this. Also if you feel like doing your bit for charity and want a designer wallet, on Sunday Oxfam launched some exclusive designs for the wallet that have "have totally transformed the ubiquitous travel cardholder, which has become an iconic symbol for modern city dwellers." You can buy them for £4.99 from Oxfam's Notting Hill and Westbourne Grove stores in London or get them from Oxfam's eBay store for a limited period. 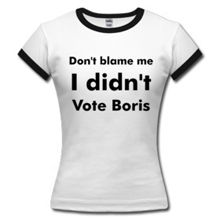 Alternatively, you can get one for free if you sign up to the I'm In campaign through Oxfam's street teams, who will be on the streets of London from Monday March 26. 90% of visitors are looking for travel information! In what will be a surprise to no one, ninety per cent of visitors come to TfL's website looking for travel related information. I'd be quite interested to know what the other 10% are looking for. Although, I imagine there's a number looking for jobs and careers. You'll be pleased to hear that the Transport for London website is getting an overhaul sometime this month, basically making it easier for you to find that travel related info. We can be thankful that the horrible ticker tape of Travel Delays is dying a death and that service updates are going to prominently positioned on most pages of the site. Also the refunds section looks like it will be a little easier to find, as I've lost count of the amount of times my colleagues have asked for that link. It's surprising that only 20% of visitors come to the site looking for a Tube map, as if I was a betting woman, I would have put the percent much higher than that. Overall, it looks a lot cleaner and I'm sure the larger top navigation buttons will were built with accessibility in mind. Hopefully, the new search powered by Google will pull up the most relevant results as the current search facility isn't great and I rarely get the results I'm looking for on the first few entries. Sadly there's no user generated, trendy, Web 2.0 features though. 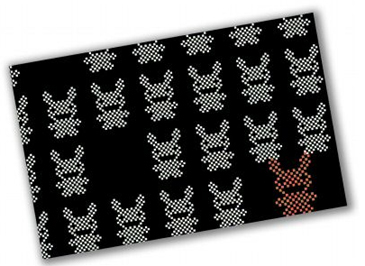 I'd love to drag and drop round items that were most interesting to me. Maybe one day we'll see something approximating a message board or at least an online polling facility. Even if they were worried about publishing the results immediately it would give us the impression that we could have some input on the site. Check out the animated walk-through with polite audio commentary, which hopes we find "the new website a great experience". 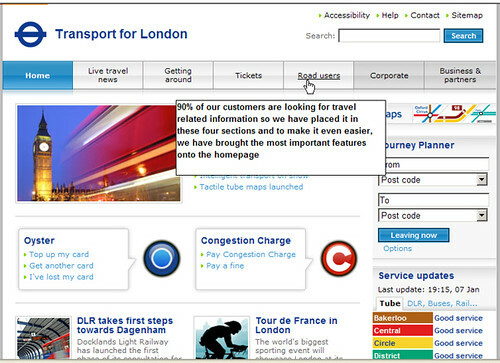 Anything else you'd like to see on TfL's site if you were giving it an overhaul? Almost on an annual basis we're promised mobile phones on the Tube. For me, it's not going to make a huge difference as half of my journey is overground and I'm used to hearing - "I'm on the train", or "Just about to go into a tunnel so can't speak". But for the more subterranean of you, I wonder if it'll be more of a help or hindrance. 45% of the Tube's network is below ground and out of current mobile network coverage. In an LU survey of 1,007 respondents conducted in February, 34% said that if it were available they would be very likely to use a mobile phone in all parts of the Tube, including trains and stations. A total of 22% said they would be fairly likely to use a mobile, 19% not very likely, however 23% said not at all likely. Around a year ago Tfl said "It is our intention to commence a trial at a small number of Tube stations in late 2007 with the aim of introducing mobile phone and new technology provision at stations from summer 2008." Last week it appears that the technology was trickier to install and it's been delayed by another year "The earliest the trial will begin is in April next year and if it is successful, will be extended across the Tube network. 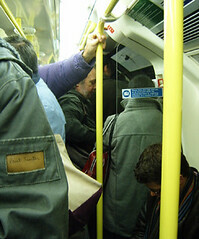 LU said the earliest date mobile phone coverage could be extended across the Tube network is mid-2009." The Waterloo & City Line will have a six month trial so if you want to hear lots of conversations about people's bonuses and how stressed and over-worked they are you know where to head. Or not. 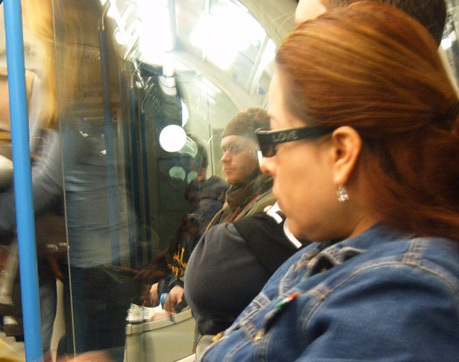 Once again Friday's look at Tube Fashion Victims, TFV's or travellers spotted on the Underground who could be considered as suspects for a fashion police line up. This week's with the brighter weather we've had there's been a number of spots of the cardinal sin of shades worn inside. Definitely a Nicole Richie / Posh Spice / Lindsay Lohan oversized frame or aviator goggles look here. We hadn't quite gone underground when I took the picture, but when we went underground she kept the shades on and carried on reading. 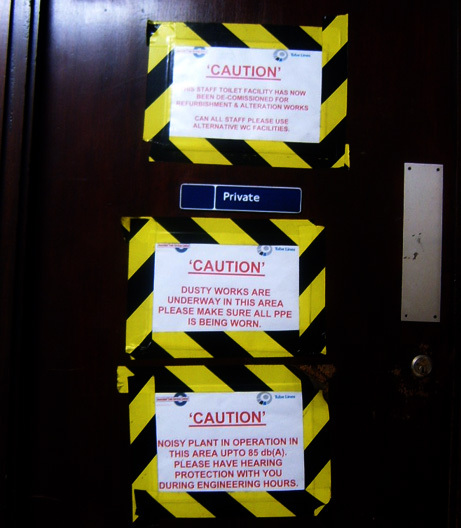 It doesn't quite have the same frightening edge to us commuters as this, but as a member of staff I'd think twice about bursting through this door at Leicester Square Tube. Particularly if I was desperate for a loo break, didn't have any earphones on me and PPEmart were fresh out of PPEs. If you watch BBC4 you've probably seen the trailers for Tube Night which is a full evening of treats from the BBC's drama and documentary archive (including Underground Ernie & vintage Dr Who - the BBC built sets of stations and tunnels which were so realistic that London Transport accused them of sneaking a film crew in without authorisation) plus a rarely seen 1950s gem about night workers from the vaults of Transport for London. The programme was commissioned following the success of last year's Bus Night and has been produced by the same team - Lone Star Productions. Robert Elms will be hosting the night from 8pm on Sunday 18th March (Mother's Day) and look out for Arena at 9pm with a cast of key characters including me! I spent a day with director Zimena Percival & the production team on this last year and am (sort of) looking forward to seeing the resulting five minutes. Londonist imagined that I'd be "drooling over this kind of evening in front of the TV", however I'll be hoping that I don't look like too much of a nutter, as we filmed some fairly silly looking parts as well as the more serious aspect of the blog's reaction to July 7th. "Her apparently flippant website became a nexus for all things underground on July 7th. Annie shows us the world she opened up before and after the atrocities of that day." However, the rest of Arena looks fascinating and will begin 150 years ago in a Victorian London of slums and gaslight and come up to the present day with yours truly. I'm particularly looking forward to this part "Dr Peter Collett - presenter of Channel 4's Bodytalk and one of the original psychologists on Big Brother comments on the unique, sometimes downright weird behaviour to be found on the Tube". 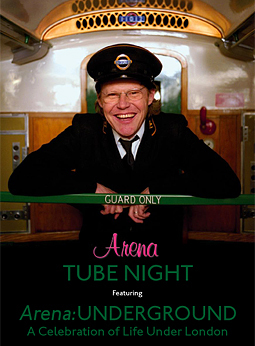 If you have any Tube stories you'd like to share for Tube Night on the BBC's site please fire away! 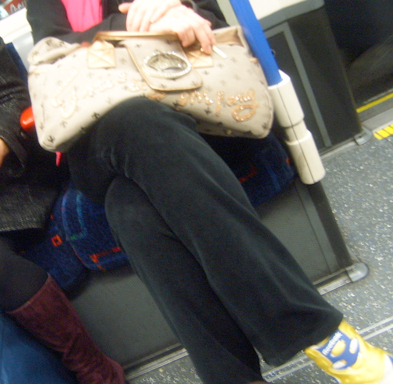 It's Friday and time again for the TFV's or Tube Fashion Victims, commuters spotted on the Underground following a trend or with their own special take on a trend. This week's theme is one that Oscar Wilde would be proud of...... handbags. 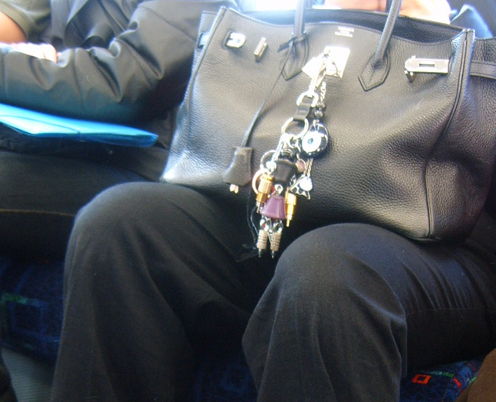 I've seen a lot of women with various key rings or "jewellery" attached to their bags but never quite as many as this lady's. Perhaps her aim is to have more on the outside of the bag than there is on the inside. I'm not sure if the latest trend in bags has anything to do Helen Mirren's success with The Queen, but there's a growing amount of women carrying bags with crowns on them. I thought it might have been an overseas trend originally, as these girls had come in from Heathrow and were speaking in a language I didn't recognise. The girl opposite also had a matching bag. But I saw another one on Tuesday and this woman was sans luggage and wearing some street shiny Reeboks, and had a wearied regular commuter look about her. Can someone please explain these bags? Have they replaced the metallic bags of 2005/2006? I'm assuming they're a "knock off" or replica of some expensive design. 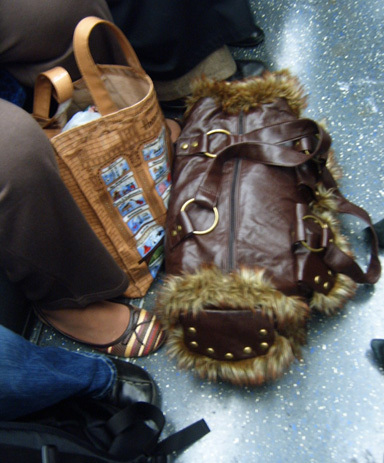 I could only spend so long looking at designer bags on The Bag Lady Blog without feeling demented. I only managed to spot a few bags with smaller crowns on them - most notably one with a fly wearing a crown, so someone, somewhere must be responsible for these crowns. Who is it? Marc spotted that the trailer for Hot Fuzz features a miserable looking Simon Pegg in a tube carriage. As I've not seen straphangers like that for quite some time, I'm presuming it was filmed in a set or at the London Transport Museum. Anyone have any thoughts on that? 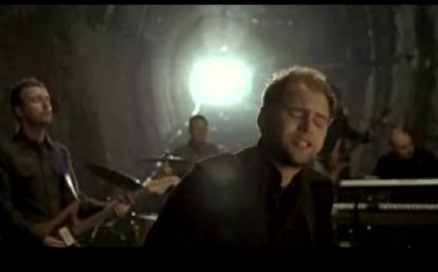 Also perhaps you can identify which disused station was used for this video "Wicked Man's Rest" from the band Passenger. 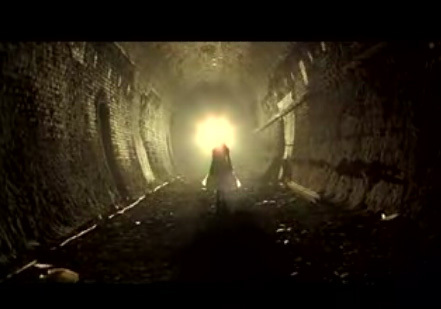 Stewart B sent this to me and it looks very similar to the tunnel in the Prodigy's Firestarter which was filmed at Aldwych. I've really had a record fortnight of making Customer charter refund claims on the District Line. It felt a bit like Groundhog day. I left the house in the morning and there was a film crew outside my local Indian restaurant. Got to the station - District Line screwed. Returning home at the end of the day, the District Line was still screwed, but at least the film crew had moved their position by 20 yards and were now outside my local chippie. It was heartening (I think) that the drivers sounded as fed up as all the passengers this morning. On leaving Gunnersbury we had the following warning of the short sharp stop the train would be making, just so we could actually get anywhere. You'll note more than a touch of exasperation and "let's get a move on" in his voice as he says "Mind the doors". When we got to the next station at 9.30 our driver kindly reminded us of just how delayed we were. "This train should have been here at 9.11". This makes filling in your customer charter claim so much easier. At Leicester Square I was greeted with the image at the top of this post. So more than ten hours later the line was still screwed due to the earlier delays at Gunnersbury. I'm not sure why the "MINOR DELAYS" warranted capital letters though, perhaps minor delays are somehow seen as more important than severe delays. Who knows? He said "During research I learned that people can sleep when their bodies are held in a rigid state as opposed to only a soft and yielding state - similar to most beds. I applied this concept to the Excubo jacket - a jacket that transforms into a firm and protective shell around the user." Excubo is Latin for "I sleep outside", and it doesn't just hold you upright (handy for fellow passengers) but it also serves as a duvet, sleeping mask, mittens and a pillow. 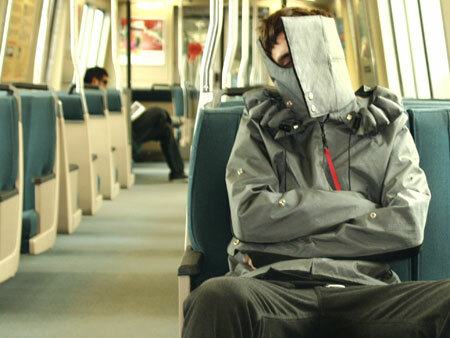 Gale, from San Franciso, came up with the idea after watching fellow commuters struggle to stay awake. He's now in talks with manufacturers to mass produce the jacket to sell around the US and the UK. 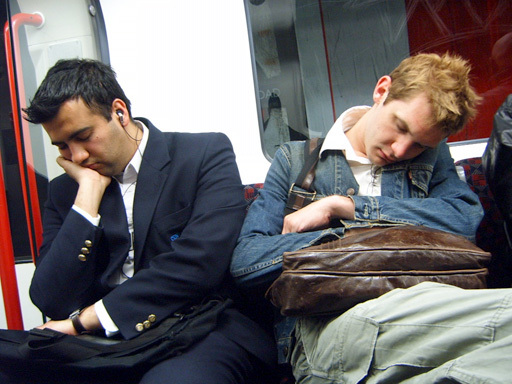 Full set of Sleeping Tube Commuters here. All the sleeping jacket guy needs is a partnership with the guys who produce the "wake me up at" stickers and he's onto a winner. 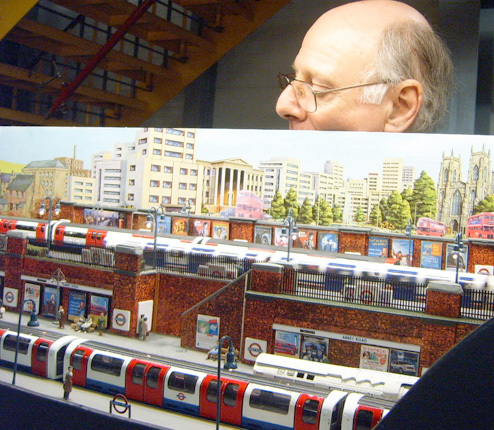 Sorry I should have blogged about this earlier to give people more advance notice, but this weekend, the London Transport Museum Depot at Acton is holding an exhibit of models of London's Transport. You can see "professional and amateur modellers' layouts ranging from five to twenty feet in length and from '00' gauge to '0' gauge for the working layouts"....whatever that means. Also "large or small, scenes are depicted right down to the finest detail and cover all modes of London travel from Underground trains and trams to cycling and walking." The weekend will also feature rides aboard the Museum's own miniature railway, plus craft activities for all the family. Admission (tickets valid both days): Adults £6.95, Concessions £4.95, accompanied children under 16 go free. For full details click here. Here's a report from the last time I went. Although there was a three-to-one vote in favour of strike action on February 19 by RMT's 6,500 London Underground members, you'll be pleased to hear that threatened strike has been called off. LUL have agreed to the four per cent wage increase, with no strings attached. The RMT's site says "the breakthrough was due to the fact that the union's LUL members had shown they were not prepared to be pushed around." Union leader Bob Crow added: "Management's decision has, at last, opened the way for the implementation of last year's pay deal. If London Underground management had not attempted to attach strings to the deal in the first place then we could have drawn a line under this matter more than a year ago." All Underground staff are also eligible for a bonus of £250 or £500 each year if customer satisfaction targets are met or exceeded. Ah that's just reminded me to put in my second customer charter refund claim of the day, but I digress. Sheriff Ken said "This three-year agreement is great news for both Tube passengers and staff and is a real landmark achievement. Passengers will benefit from the stability provided by the first three-year deal for all staff in the history of the Underground."